There’s a lot to learn about mountain exploration, and Angela Hawse has mastered virtually all of it. In 2010 she became the 6th U.S. woman to earn IFMGA/AMGA Full Mountain Guide Certification, spanning three climbing disciplines (Rock, Alpine, and Ski Mountaineering). She’s mounted five Denali expeditions, helped Tom Whittaker to become the first amputee to summit Mt. Everest, led an all-women’s team atop 22,494-foot Ama Dablam, and completed a 26-day self-supported ski traverse across Lapland from Sweden to Norway. And that’s just the highlight reel. Her latest exploits are closer to home. The Ridgway, Colorado resident is now a ski guide and snow safety specialist for Telluride Helitrax and co-owner of Chicks Climbing and Skiing. 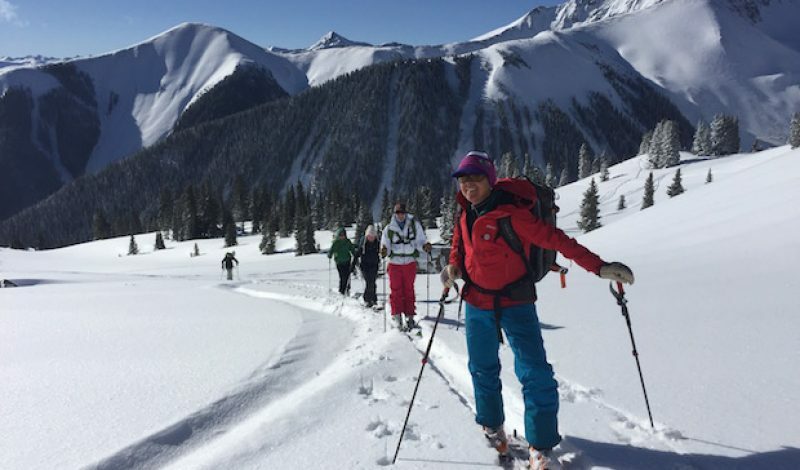 Formerly known as Chicks With Picks (because the women’s-only programs focused on ice climbing), Chicks offered its first-ever ski programs during the ‘15/’16 winter season, drawing on Hawse’s savvy to lead groups of women to Japan and into backcountry huts scattered across Colorado’s San Juan Mountains. But they know Hawse has their back, allowing them to stay safe and learn best practices as they travel through the mountains. Here’s what Hawse carries on spring ski ascents to stay comfortable—and alive. Gear Institute: How do you access weather forecasts while you’re out in the backcountry? Angela Hawse: Right before I head out, I visit weather.gov and click on the map to get a point forecast for the zone I’ll be in. Forecasts for cities and towns generally aren’t helpful, because they reflect the valley weather rather than the conditions we’ll encounter at higher elevations. So I take a screen shot of those point forecasts, along with their hourly graphs, so I can access all that data from my phone regardless of connectivity. I also study weather station readings and read the Colorado Avalanche Information Center’s backcountry avalanche bulletin. GI: So are you incommunicado on most trips? AH: No. I always carry the DeLorme InReach satellite messenger, which reliably sends an emergency notification for help if the situation is life-threatening. Even better, it enables me to text local contacts to check in. I use the DeLorme instead of the SPOT, because for international travel, I have historically had much better reliability with the Iridium satellite system (used by DeLorme) than Globalstar (used by SPOT). GI: Speaking of tech devices, do you use your iPhone for anything besides weather images? AH: I use the Avanet app for sharing observations with the backcountry community. It is a great tool that provides many different possibilities to record, share and track critical timely information in the mountains. I also use GAIA for navigation. There are many apps out there, but I find this one to be very user friendly. GI: What safety gear do you carry? AH: The standard carbon avalanche probe, shovel, snow saw and snow kit with a thermometer and snow crystal card. I pack the Alpine Threadworks Ski Guides’ Rescue Tarp, which can provide emergency shelter or create an evacuation sled. In spring I bring a nub of Black Diamond Glop Stopper Wax to keep climbing skins from clumping up with snow, and some Swix F4 Universal wax for ski bases. I always carry a multitool—I like the Black Diamond Binding Buddy—along with a lightweight knife, some Voile straps and zip ties, a first aid kit and a repair kit containing an assortment of hose clamps, small piers, beefy rubber bands, duct tape, bailing wire, and a fire-starting kit. GI: What are those hose clamps handy for? AH: They’re indispensable if you throw a binding or break a pole. They’re also good if you need to reinforce a sled for pulling someone out of the field. I’ve used them mostly for broken bindings and just lashed the entire hose clamp around the ski and binding. Doesn’t make it skiable, but it does make it possible to get out of the field a lot faster. GI: You probably need an extra-big pack to fit all that? AH: No, I fit everything I need into the Osprey Kode ABS 22, and if avalanche conditions are considerable, I zip on the ABS Vario airbag. GI: Do you feel that carrying an airbag changes your assessments in the backcountry? AH: It doesn’t increase my confidence to jump into something I wouldn’t if I didn’t have my airbag. I still make good decisions and terrain choices. But skiing in avalanche terrain is a little like Russian Roulette. The reality is, slopes may have weaknesses that I can’t see, or know exactly where they are. It’s just like crossing glaciers in early summer, when they’re still snow-covered. I wouldn’t cross them without being roped up in the case of a fall. So when I’m skiing, I increase my margin for safety by wearing an airbag, and I practice deploying it at least once per season. I’ve seen them work and I am a believer. GI: What are some of your other mainstays? AH: One of my sponsors is Marmot, which makes some terrific backcountry products. 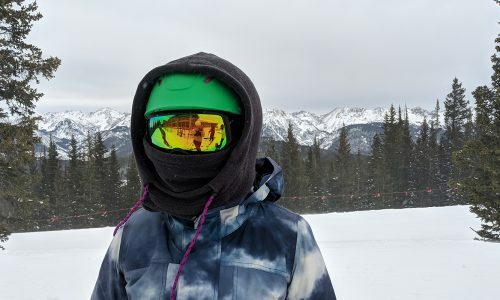 I like the Estes Hoody Softshell because it’s very lightweight, has excellent windproofness, and breathes very well for uphill skiing. It is also very stretchy, which gives me great mobility and makes skinning and skiing with a pack (and avalanche transceiver, etc) more comfortable. It packs down small, has pockets that are useful with a pack or harness on, and the hood fits over a helmet. Colors are great, too. It’s good to be visible out there! When I do pull a hardshell out of my pack for foul weather or high wind, I want it to be bomber. The Exum Ridge is not only bomber, but it packs extremely small and is very lightweight. 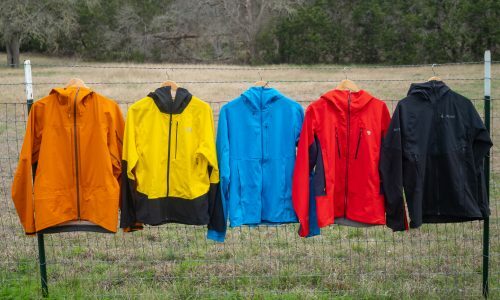 I’m a big fan of GoreTex and its Active line is the best in class. The jacket has some stretch and breathes better than most hardshells. It’s a minimalist piece with no added bells and whistles. The pockets are usable with a pack or harness on, the hood fits over a helmet, and the zippers are waterproof (eliminating the need for a flap, more Velcro, and added weight.) My favorite color is Sweet Orange. And the Women’s Spring Glove is excellent for spring skiing and alpine climbing in the summer. It’s waterproof and reasonably breathable, with high-quality leather palms combined with stretch nylon for a perfect fit. Very easy to wear when doing high dexterity tasks like adjusting boots, placing gear, and digging anchors. For alpine climbing, it can’t be beat. GI: Those sound like true workhorses. Thanks for filling us in. What’s on your list for this spring’s skiing and climbing? AH: I have a few programs I am running for the AMGA, training and examining guides this spring as well as some great new rock and alpine clinics with Chicks Climbing and Skiing. We kick off with a crack-climbing clinic in Indian Creek, then City of Rocks, and launch our first alpine program in the Tetons. Although I’ll do some dawn patrol missions for some spring skiing in the San Juans, I’m close to switching out my ski boots for rock shoes!